Benjamin Simons received several land grants in the area. This property would become Middleburg Plantation and was later subdivided into multiple plantations in 1789 (3). 1717  Benjamin Simons died leaving his plantation to youngest son Benjamin Simons II (3). 1722  Benjamin Simons II passed away. His son Benjamin Simons III inherited the plantation (3). 1789  Benjamin Simons III died and his Middleburg Plantation was divided among his three daughters. Catherine Simons Hort inherited 768 acres which became known as Simonsville and Horts (1, p. 7) (2, p.16) (9, p. 66).
?  John Bryan owned the plantation (3) (9, p. 66). 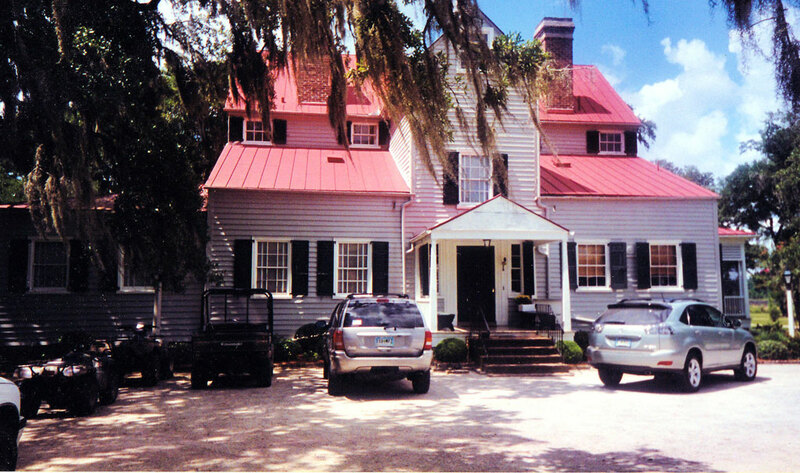 Bryan also owned nearby Camp Vere Plantation whose lands also had once been part of Middleburg Plantation. 1843  The plantation was sold to William James Ball. It was called Horts Plantation at this time but Ball changed the name to Halidon Hill (1, p. 7) (2, p. 16) (5, p. 58) (9, p. 66).
?  John Coming Ball acquired Halidon Hill (6, XII: 26) (9, p. 66). 1872  Ball foreclosed on a loan that Simons descendants had taken out using Middleburg Plantation as collateral. Ball had previously acquired Halidon Hill and Smoky Hill and merged all three back into one at this time. 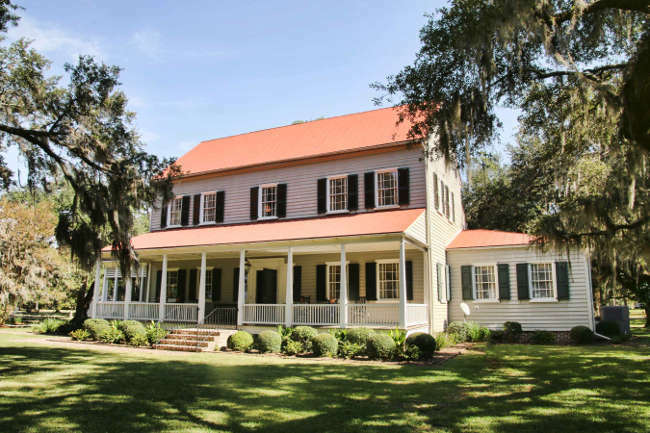 He called this merged property Middleburg Plantation (11). It appears sometime during ownership by the Ball family, the property of Middleburg Plantation was once again divided and Halidon Hill became a separate holding.
?  Thomas A. and Mary Vereen Huguenin acquired the plantation (1, p. 1) (6, XII: 26). 1954  The Quinby house was rolled four miles through the woods via a narrow highway to its present site at Halidon Hall. It was renovated by Mr. and Mrs. Huguenin (1, p. 2) (2, p. 17) (5, p. 58) (6, XII: 26). 1985  Thomas A. and Mary Vereen Huguenin were the owners of record (1, p. 1). Prior to 2014  Richard and Vereen Coen acquired Halidon Hill. Vereen is the daughter of Thomas and Mary Vereen Hugeenin. The Coens have placed a portion of the plantation under a conversation easement (10, p. 7).